Manitoba's Progressive Conservative leader says his party can reduce the record number of children in care by ensuring parents have jobs. During an economic announcement Tuesday, Brian Pallister said he will address Manitoba's child-welfare crisis by boosting the economy, if his party forms government April 19. 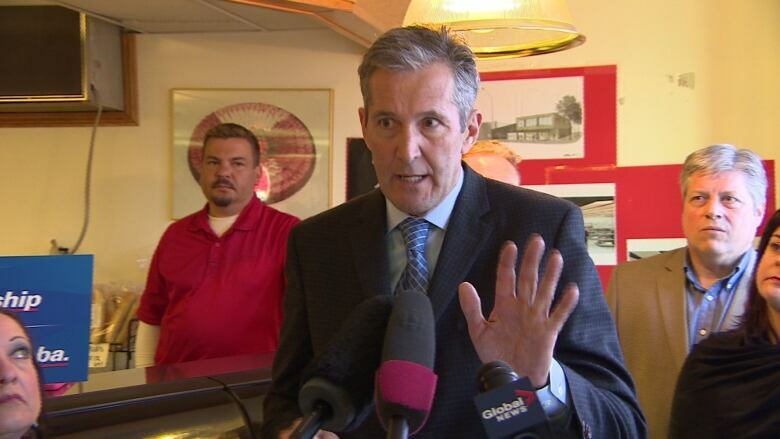 "Poverty and the demand for CFS services are inseparably linked," Pallister said in response to a question at an event in a north Winnipeg riding. "The fewer job opportunities there are for working Manitobans and families, the more demand there will be for CFS services. "We're talking about job creation today, because it's at the cornerstone of how we work our way out of the dilemma we face." Manitoba has more than 10,000 kids in the care of Child and Family Services. The vast majority are indigenous. The province has one of the highest apprehension rates in Canada and seizes an average of one newborn baby a day. The cost of the department has ballooned to almost $500 million and routinely is criticized for apprehending too many children or repeatedly returning others to abusive guardians. The Conservatives while in Opposition have been harshly critical of the NDP for its handling of child-welfare services, but have not formally presented alternatives since the campaign began last month. Pallister initially bristled when asked about the party's social platform Tuesday, saying he was only there to discuss "our message today" regarding small business policy. "You're choosing the questions and I'm choosing which ones to respond to," Pallister said. He later apologized. Somebody has to foot the bill for social services, which is why the province has to encourage small businesses, Pallister said. First Nations children's advocate Cora Morgan said the solution is much more complex. Whoever forms the next provincial government, she said, has to address intergenerational trauma of residential schools and the effects of the '60s Scoop, in which indigenous children were taken from their homes and placed with non-indigenous families. The province also has to bolster support for addictions issues and help for women escaping domestic violence, she suggested. None of the three mainstream parties is really addressing the problem, she said. "We have something that is really horrific happening in Manitoba and it's not getting the attention that it deserves," said Morgan, whose deputy is on leave running as a Liberal candidate. NDP Leader Greg Selinger said a re-elected NDP would reintroduce its customary care legislation — a bill which died when the election was called. It would have placed children at risk of apprehension with a family member in their community. The NDP would also look at changing how child-welfare agencies are funded, giving them an incentive to prevent apprehensions rather than giving them money based on the number of children in their care, he said. "That kind of misses the point. There is still too much money going on the back end." Liberal Leader Rana Bokhari was not immediately available for comment. Last week, one of her candidates said the party would like to cut the number of children in care by half, but had few concrete examples of how it would accomplish that.